Since the founding of Genelec in 1978, professional audio monitoring has been the core of their business. An unrivalled commitment to research and development has resulted in a number of industry firsts and established Genelec as the industry leader in active monitors. Over 35 years later Genelec monitoring products remain true to their original philosophy, offering reliability, neutral sound reproduction regardless of size, as well as the ability to adapt frequency response to the listening environment. SAM systems can be controlled with digital networking, enabling you to build highly flexible computer controlled systems of monitors and subwoofers. The acoustical features of SAMs can be optimised with software calibration features for different working styles or client demands. Today, SAM reflects the most advanced monitoring systems available in the audio industry. 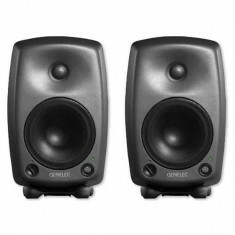 The Genelec 8030a Studio Monitor is available at Mic Hire.